It's funny the way some places get reputations, almost to the point of clich�s. For example in a quick association test, which phrases come to mind for: 1) Pit, 2) Hat Creek, and 3) Lake Almanor? Most of us would probably think 1) Hazardous wading, 2) Crowded, and 3) Hex Hatch -- even if we had never fished those places. So, what is the first phrase that comes to mind when you see the name: McCloud? You'd be surprised how many anglers would immediately say, "Cathedral." As far as I can tell, this association between the McCloud and a religious experience started the first day an angler set foot in this magical river. The Lower McCloud, the section below the McCloud Reservoir, is particularly exquisite since it runs through a magnificent rugged canyon. It is so scenic and so full of trout that it was a favorite summer retreat for the rich and famous, most notably Willam Randolph Hearst, who built the 67,000-acre Wyntoon Estate near the McCloud falls. Modesty was not his style. The area surrounding the now-popular Ah Di Nah campground 10 miles further downstream was purchased by Hearst at the same time to serve as the fishing villa for Wyntoon guests. The stone foundations of the buildings are still evident at the campground. The Nature Conservancy owns about 6 miles of river property just downriver from Ah Di Nah. 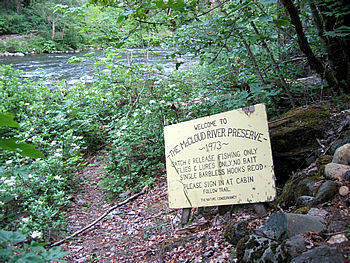 Of this 2.5 miles are available to catch and release fishing with the following restriction. 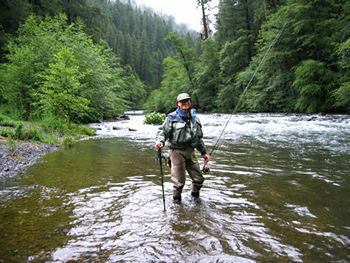 Only 10 anglers are allowed on the river at any one time. Of these, 5 slots (or "rods") can be reserved in advance and the remaining are walk-ons. As expected, on summer weekends, most of the walk-on tags are gone faster than a caddis can hatch. The obvious benefits of fishing the Preserve water include the relative solitude and the use of a nice trail system that the Nature Conservancy maintains. Recall that this is essentially a river canyon, so access in many places is impeded by the rugged terrain. 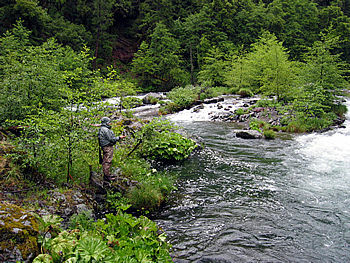 The water upstream of the Conservancy, through Ah Di Nah and towards Ash Camp, is unrestricted and often fishes as well as the Conservancy water. I had fortunately managed to snag all 5 of the reserved rods for two days in June. Bob Schwehr and Kelly Bandlow enthusiastically agreed to attend. I had expected Mike and Pat McGuire to come but they ran into some last minute complications. Of course, living in California we never have to worry about weather in June, right? However, against all odds, our little excursion coincided with a powerful storm system, which resulted in chain controls over the Sierras and 18 inches of new snow on Mt. Shasta. The Upper Sac was in the process of blowing out, the flows rising 6-fold to 7000 cfs from the normally high spring runoff. Fortunately, the Conservancy sits below Lake McCloud, and much of the water is piped to the Pit River via Iron Canyon. So despite the heavy rain, the McCloud remained wadable throughout our entire trip. Bob headed up early on Thursday to set up camp. Kelly and I left late Thursday night after the PFF general meeting and overnighted in Redding. Despite the weatherman's promises that the storm would degrade to scattered showers, as we got further north Friday morning, the rain got heavier. One nice surprise, however, was the discovery that the first half of the dirt road leading to the Ah Di Nah campground has been re-graded. Instead of the 5 mph crawl over washboards and rocks, you can now keep up a constant 25 mph on a smooth surface. As we pulled into the campground, I told Kelly that I knew exactly which campsite Bob chose. You see, Bob is an ex-Boy Scout troop leader and has a scout's touch for stringing tarps. 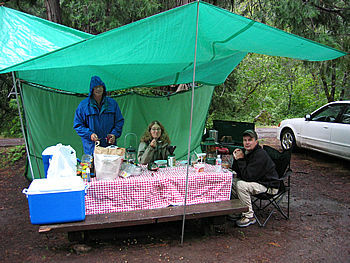 Only one campsite had a magnificent tarp (complete with back wall) over the picnic table and a 3-burner stove. Bob had already headed down to the Conservancy to fish, but I recognized his signature tarp talent immediately. Who's wetter, Kelly or the fish? With all the rain, I was beginning to worry. The last time I had fished the McCloud in the rain, I was humbled with a skunk. We quickly rigged up at the Conservancy and claimed our tags around 10 AM. Almost all of the walk-on tags were still on their hooks at the caretaker's lodge. I admit breathed a sigh of relief when Kelly nailed the first rainbow. If anyone is in that 10% of anglers who catch 90% of the fish, he certainly is. At least I had confirmation that the fish were not turned off by the rain. We worked our way downstream in heavy showers broken by optimistic drizzle, picking up a fish here and there -- mostly small. Overhead a bald eagle silently soared upstream. Kelly was using his 11-foot rod and a big fluffy white indicator. His theory is that white scares the fish less -- they think it is just part of the foam. In fact, I've even seen people using sky blue ones for a similar reason. On the other hand, I use a color so obnoxious and insulting to the eye that the trout immediately recoil in horror and run right into my pheasant tail. I could use my indicators to spell out SOS on the ground and the National Guard would show up with a rescue helicopter. Eventually we ran into Bob who was taking advantage of a brief break in the rain to eat his lunch. I know Bob's preferences well enough now to know that he probably made a beeline to one of his favorite pools near the lower reaches of the Conservancy. In fact I've come to know this pool as Bob's pool. (To be honest, Bob insists that his pool is actually further upstream, but it "doesn't work anymore.") Since he was headed up and we were headed down, we agreed that we would meet back at the entrance at 7 PM. While we were sitting there, we could see a few splashy rises every now and then. Whatever was hatching must have been pretty small, certainly not the caddis that I normally associate with that type of rise form. My best run of the day was when we arrived at Bob's pool. It starts with a wide, fast riffle that flows swiftly into an elbow pool turning to the right (facing downstream). On the inside of the elbow is a large gravel bar forming a perfect casting spot. The trout continued to rise, but they were, of course, splashing around on the outside of the elbow, where the water was bent by the granite bank. I stubbornly continued with the indicator but with nothing to show for my efforts. There was little hope of fishing a dry either, since getting a drag-free drift was nearly impossible at 60 feet with a torrent of water in between. Sitting there scratching my head, a voice from above gave me the answer -- no, not the Force, use soft hackles! I learned this trick from Mike McGuire. A soft hackle is fished on the swing near the surface, so drag is actually useful in imparting movement to the fly. Since the fish are looking up, maybe they would fall for something moving quickly? I re-rigged with a herl-brush soft hackle on the top and a partridge-and-red on the bottom. After a quick look around to be sure a tree hadn't snuck up behind me, I let fly. To get a really long drift, I mended out a bunch of extra line and let the current do its stuff. Just as the big loop of line straightened out, ka boom! I was rewarded with a feisty 12-inch trout. While that pool probably gets fished hard, I think that they just hadn't seen anything like a soft hackle for a while. I proceeded to land 5 more fish in the same fashion, all sent back to ponder their lesson. Kelly and I hiked back to the Conservancy entrance where Bob was talking to the caretaker. When we approached, the caretaker thoughtfully noted that we had at least 2 more good hours of light left. He was correct, but my growling stomach and the need to pitch my tent got the better of me. We returned our tags and headed back to the campsite. The rain had mercifully stopped and the lull gave us enough time to set up tents and cook dinner in relative comfort. While we were sitting there, snug under the tarps with two lanterns going, Anne Marie Bakker from the Golden West Women's Fly Fishers drove by. They had scheduled a fishout at Ah Di Nah, but not unexpectedly, not many members were showing due to the horrible weather. Eventually one other GWWF member showed so we gave the two extra Saturday rods to them. The fishing Saturday was even better than Friday. In fact, I learned yet another trick about the McCloud. 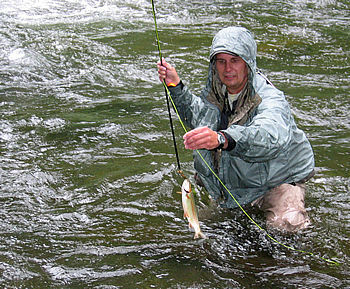 If the foam lines and plunges at the heads of pools aren't producing, fish the pockets in the slower riffles. Throwing the indicator into the plunges between rocks frequently resulted in quick strikes as the fly drifted through the slack water. Some of the fish were surprisingly large for such skinny water. Two were better than 15 inches. By the end of the day, Kelly was top rod, with about 18 fish. Anne Marie and Kate (the other GWWF member) joined us for dinner and we built a nice fire, which chased off the damp chill. Since Kelly's tent was still flooded, Bob made up a cozy bed for Kelly in the back of his enormous Chevy Blazer. As everyone turned in, I gazed up and above the darkened McCloud canyon walls, the moon was rising behind the scudding clouds. The storm had finally broken. If you plan to fish the McCloud, particularly in the hotter summer months, you should be aware of a strange phenomenon that sometimes occurs. Many McCloud tributaries originate from glaciers high on the slopes of Mt. Shasta. In particularly hot weather, the melting glaciers release so much water that fine silt starts to wash into the McCloud, particularly via the appropriately named Mud Creek. Mix in a couple good thunderstorms to accelerate the flows and the McCloud River takes on the tint of turquoise milk until the temperatures drop again. It goes without saying that when this happens, the fishing is mediocre. Fortunately, for the internet-savvy fisher, there is a way to check on this phenomenon from the comfort of your PC. You can access turbidity data supplied by the CA Department of Water Resources. This last figure is an example of a turbidity spike that indicates you should fish elsewhere. For more information including directions and reservation phone numbers, visit the Nature Conservancy's web page for the McCloud Preserve. McCloud flow and turbidity data from the CA Dept. of Water Resources is available here. Finally, here's a fascinating geological and historical discussion of Mt. Shasta mudflows including some video for those of you with broadband service.